I made this dress a while ago for the series hosted by Hayley of Mouse House Creations and Celina of Petit a Petit and Family. 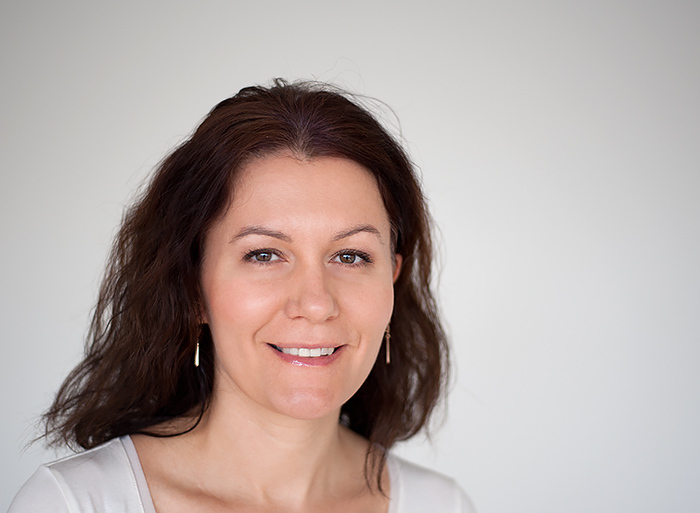 I still love the dress and wear it often, it is also one of my most viewed posts. I had quite a few requests for the tutorial of the circular insert. Yesterday, I was making a pair of pjs for my daughter and thought it would be a perfect opportunity for me to do the tutorial. This step is very technical. 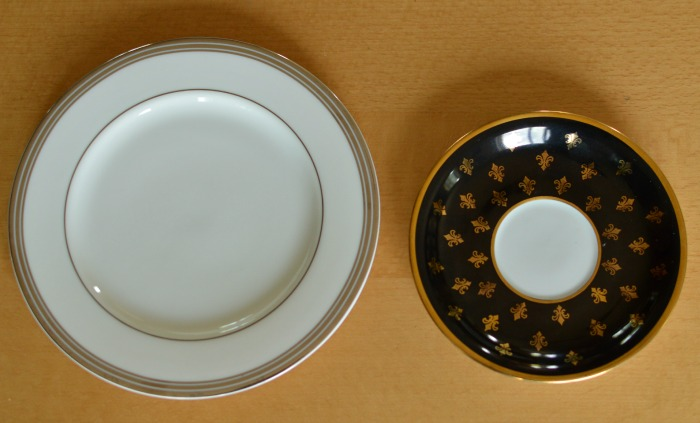 :) You will need two plates to make circles. There is no need to have a two colored circle. You can simplify the tutorial and only use one plate to make one circle. 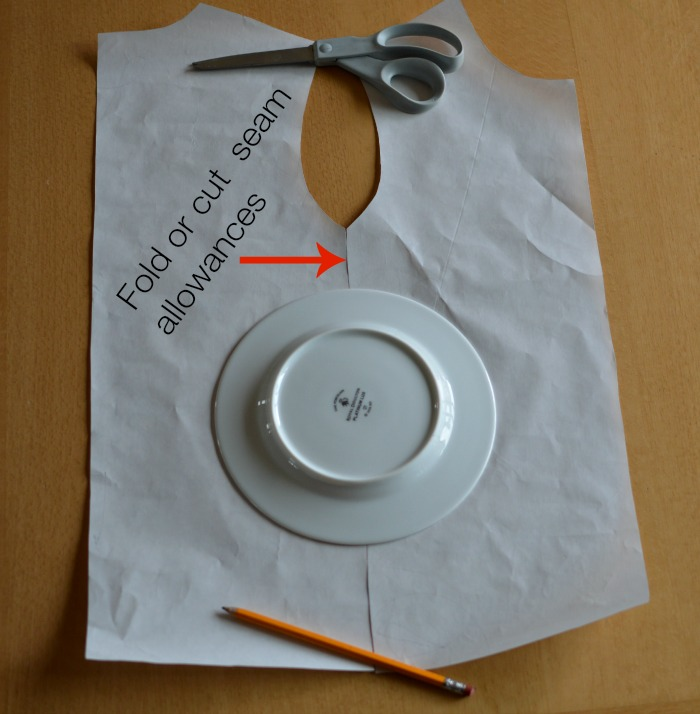 Fold or cut the seam allowance (SA) on the side seams and place the back and front bodice pattern pieces next to each other. If you are using a woman's pattern, chances are there will be a gap in the middle. It's ok. Place the bigger plate approximately around your waist area and trace. Add SA inside the circle and cut it out following the SA line. Do not throw the half circles. We will use them later to make cutting a bit easier. 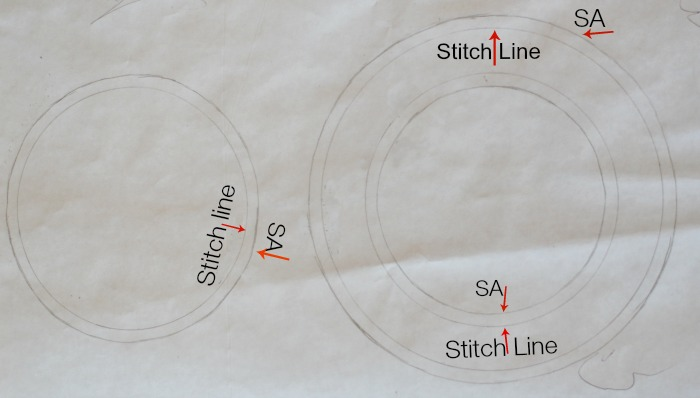 Make the pattern pieces for the insert by tracing around both plates. Place the smaller plate inside the bigger circle, make sure it is centered and trace. Add SA as shown in the picture above and cut following the SA lines. 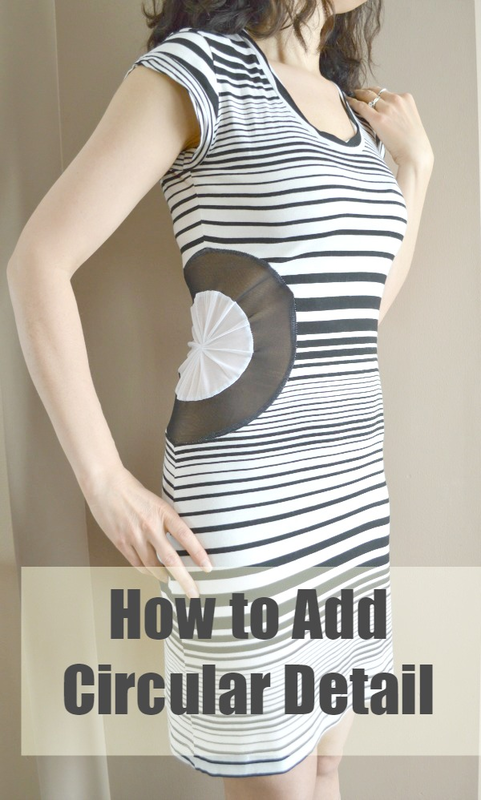 Place the front bodice piece on fold as you would normally do, add the cut out semi circle back and cut out the front bodice. Remove the semicircle and cut out top layer only. 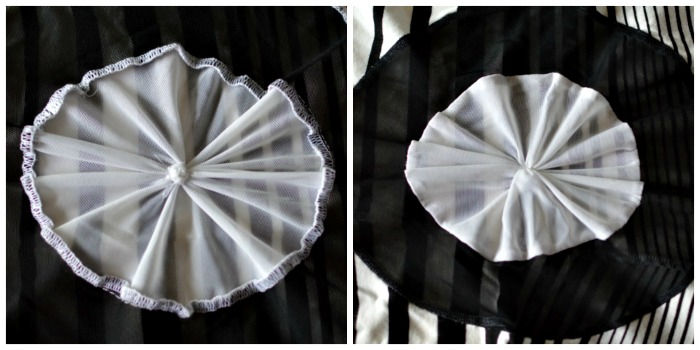 The last picture shows how the front bodice should look like, Repeat with the back bodice. Construction: Place the smaller circle inside the bigger circle, right sides facing down, pinch the SA as shown and pin in place. Stitch or serge around to join two pieces together. Caution: make sure to remove all the pins when serging! Proceed with the shirt/dress construction. 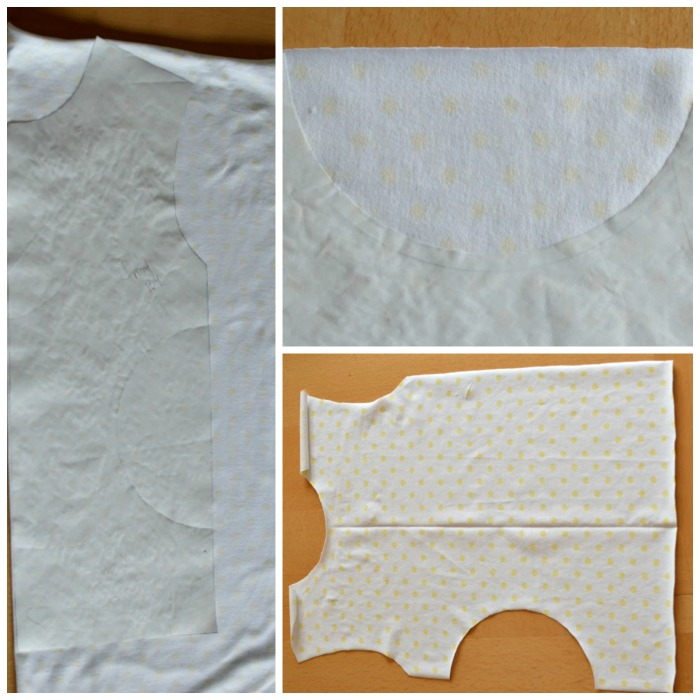 Once the side seams are joined together, place the circle you just made inside the cut out in the shirt/dress, with right sides facing down. Again, pinch the SA and pin. Stitch or serge around the circle. Now the fun part, mark the center of the circle, pinch the fabric with two fingers and twist in one direction. Experiment on the frequency and depth of the swirls. Secure the swirls by hand stitching. Stick a needle with thread at the base to hold the swirls in place. Pull the thread though. Now wrap the the thread around and secure again. Make sure you are wrapping very tightly. 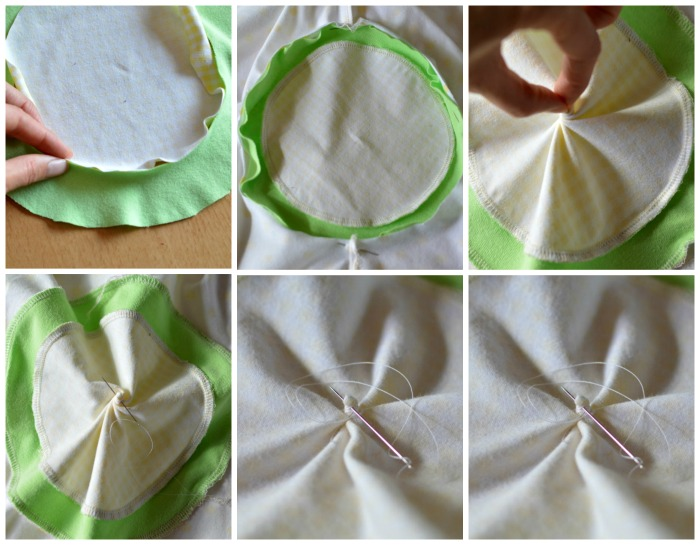 Go around the little mound on top of the swirls, tightening and securing it with the thread. While making the shirt for my daughter, I didn't want to create the swirly effect after all I was making a pajama top. I took the swirls out. 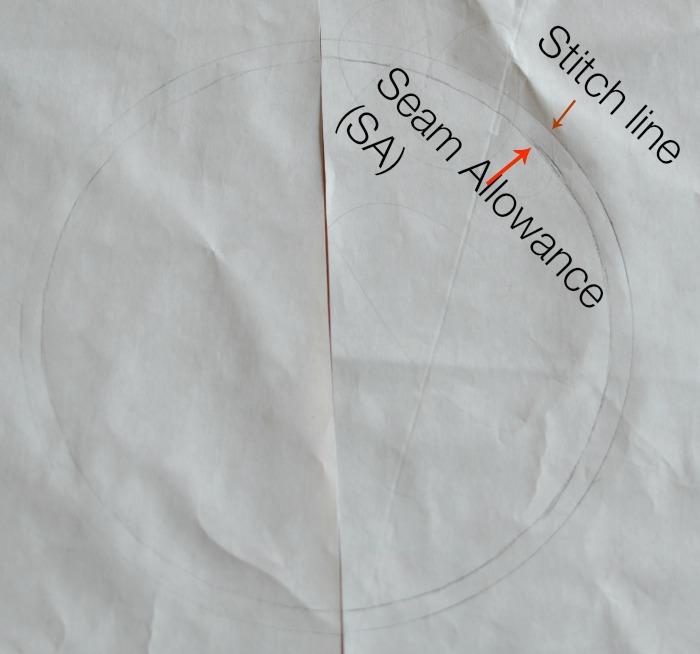 The picture below shows how much I twisted the circle insert for the dress. Once you are done twisting and securing the twists with the thread, you can cut the top off, making sure not to cut the thread. Here are how the twists look in the original dress from the wrong and right sides of the dress. You are all done! Enjoy! I love this detail. And off subject but your skin is gorgeous! Obviously you haven't been frying yourself in the sun your whole life! Ahem. Like me. Thank you for the tutorial! Color blocking with circles still scares me... but you make it look so easy. that looks SOOO great! The circles are an amazing shape and you did them perfectly... can't wait to try this. Pinned!